april 24, 2000. San Francisco’s politicians know how to manipulate our hearts and minds to get the vote they want. That’s what soft money is all about, and the power of public relations. It’s black magic — using the magic of images and sound to create a certain outcome. Take, for example, the new F line. It reminds us of the best our city can be, and we love it. 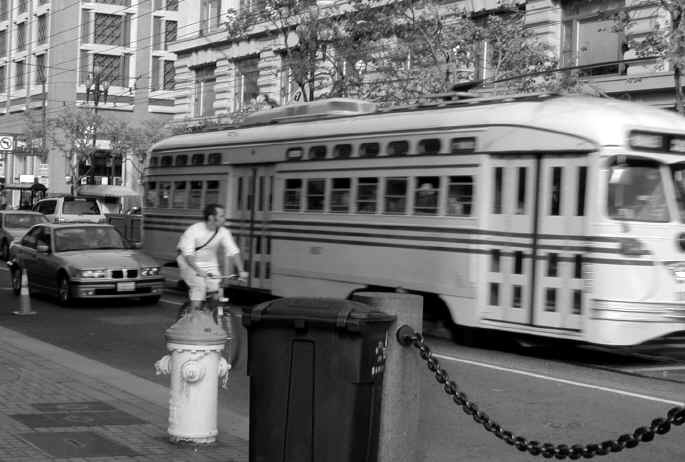 The problem is that the historic streetcar line is not modern urban mass transportation. How many locals go to the Wharf to shop or dine? Many think that these old cars are designed for tourists to come the other way. The F line connection to Fisherman's Wharf has the potential to destroy a community, another little part of this city. Some would call it a transformation, but let me give you just a few facts. Sixteen million tourists come to San Francisco each year. Almost 9 million people take the Cable Car system to Fisherman's Wharf each year on 27 cable cars. The new F line connection from the Upper Market area to the direct center of Fisherman's Wharf has almost 40 old streetcars and is now destroying the Upper Market district by transforming it into a major tourist zone. Millions of tourists will come into the center of a basically residential neighborhood. Already evictions are up, rents are soaring through the roof, local shops are selling out, and residents are moving away. Many locals made up their minds a long time ago that the F line was good for the community, by default. These old streetcars seemed like a vast improvement on the surface. But there has been no meaningful community dialogue about the potential impact of the district’s direct connection to a major tourist zone, and this lack of critical dialogue has made up their minds for them. Now that it is happening and the neighborhood is snapping into place for a different demographic group — i.e., the tourist dollar — many do not like the way it’s going. Many think that chainstores like Pottery Barn and Banana Republic want to come into this area now because of the F line tourists to come. Corporate entities put themselves in the path of growth for the potential billions of dollars they will make. If growth doesn't happen naturally, hey, why not build an old streetcar line to entice the tourists onto the cars to go for a ride. It’s sad really, that a city with such beauty has such a sordid history of political wheeling and dealing. We are in effect being led down the path of more, toward a world that is less a dream and more a nightmare for us and this city we call home. PS. And don't forget the coming of the G line, which will pass through Ninth and Irving on its way from the N Judah to Golden Gate Park. The proposed line has the potential to "transform" the Sunset district as well. Time to move to Fresno? PPS. Visit the Save the Castro website.